In case you haven't noticed, the world did not end on May 21st, 2011, as predicted by Harold Camping, the self-taught biblical scholar who runs the multi-million dollar Family Radio Network. Apparently, the fools who got caught up in Camping's trip are now saying that the failure of the world to end was a way that God was "testing their faith." Sigh. However, before we get to feeling all superior to the religious wingnuts, consider that there are plenty of "scientific" end of the world scenarios floating around. For instance, you can hardly pick up a scientific journal and not find some propellerhead talking about how we need to save the world from being hit by a giant asteroid. Pulleeeeze! Why do people make silly predictions? Well, sometimes it's simply to make money. There are few easier ways to extract money from people than scaring the Bejezzus out of them. That isn't to say that everyone who makes these predictions is on the take, of course. Here are 14 people who built their careers in part (or in whole) by predicting the Apocalypse. Some of them may just have been liars working a hidden agenda, but let's give them the benefit of the doubt, and assume they were (or are) entirely serious. In which case, they're merely fools. To see the gallery click on the NEXT button at the top right. There's ample evidence that for eight years, the leader of the free world believed that the world might end during his presidency. (The same may have been true during the second Bush administration as well.) At least twice, Reagan stated a belief that the apocalypse was imminent, and he appointed at least one cabinet member (James Watt) who was unable to do his job (protecting the environment) properly because he believed that the end of the world might make such exertions unnecessary. Sure, the climate is changing and it's almost undoubtedly the result of human activity. That being said, the dire predictions of apocalyptic proportions are seriously overwrought. Yes, the weather is likely to change and it will play havoc with crops and so forth. So what? If the human race can weather something like the Great Plague (which killed a third of the world's population), it's not going to obliterated by snowstorms in Florida or a heat wave in Alaska. Will there be weirdness? You bet. But people will adapt and eventually everything will reach some kind of equilibrium. Applegate was the prophet and seer of the Heaven's Gate community, a group that 1) build web pages, 2) castrated themselves, and 3) thought that a spaceship following the Hale-Bopp comet was going to take them up to heaven. In order to facilitate the process, 39 of them ate poisoned Jello, thereby raising the average I.Q. of the entire country. In the runup to the Y2K turnover, Ed Yourdon was the most visible of a cadre of "experts" predicting the end of the world as we know it. Yourdon predicted disasters that would ecnompass public utilities, transportation (automobiles included), banking and finance, news channels, hospitals, telephone and mail services, social security, food stamps, the IRS, and even the Defense Department. Based upon the advice of Yourdon and his ilk, companies wasted billions of dollars upgrading hardware and software that otherwise would have performed just fine. The overspending created a multi-year dip in computer spending, thereby making the recession following the dot-com crash even worse. Amazingly, he's still active as a "computer software consultant and IT expert witness" according to his website. Hard to believe that anybody still takes him seriously. The head of the Moonies first predicted that the world would end in 1967. Like many religious leaders of this ilk, when that didn't happen, he simply moved the date forward as necessary. For instance, in 1989, Moon stated that: "Six thousand years ago, humanity lost their true parents and became orphans... This signals the end of the old world and the beginning of the new world." The six thousand years, of course, refers to the notion that the world was created in 4000 B.C. What a mooncalf! Strictly speaking, the culprit in this case should be Jesus Christ, but I'll be charitable and assume that he was misquoted. Matthew 16:28 clearly quotes Jesus as saying "Verily I say unto you, there be some standing here, which shall not taste of death, till they see the Son of Man coming in his kingdom." Needless to say, true believers have found ways to argue away what's clearly a prediction of the imminent end of the world (which is certainly how it was interpreted at the time). However, the fact remains that the world didn't end, and all the people who heard (or misheard) the quote eventually died. Jim Jones was so certain that the world would end when his cult was about to be busted up that he ordered his followers to poison their children and themselves. The primary result of his prediction (and pre-emptive strike) other than a bunch of dead people, was that the term "drink the Kool-aid" slipped forever into the vocabulary of the average businessman. The prima donna of the religious right has never been averse to putting his reputation on the line with dire predictions. In this case, he not just made a prediction, but accompanied it with a bit of a sales pitch. His very words: "I guarantee you by the end of 1982 there is going to be a judgment on the world." Unfortunately, it wasn't a money back guarantee for the people who sent his organization money. Charles Wesley was no slouch when it came to scaring the Bejezuz out of his followers. He told them that the "Great Beast of Revelation" would soon appear, after which this mortal coil would shuffle off to Buffalo, as it were. Weird as his predictions were, there was apparently method in his madness: he also founded Methodism, which eventually became one of the largest Christian sects in the world. Predicted Date: 1874, then 1881, etc., etc. The founder of the Jehovah's Witnesses couldn't get enough of a good thing. Every time his prediction of the end of the world fell flat, he simply moved it forward a few years. 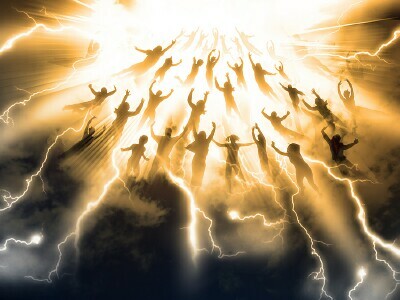 The sect continued with that approach after the old boy's death and hardly a day goes by when somebody connected with JWs doesn't trot out the idea that the "end days are near." This was the first "scientific" prediction of the end of the world. Using the then "state-of-the-art" science of astrology, Stoeffler (along with a number of other astrologers) got the people of London so riled up that some 20,000 people abandoned their homes and fled for high ground to avoid the imminent flood that would herald the end of the world. Contemporary reports say that a number of clever thieves took advantage of their absence to burgle unmolested. When the world didn't end in the 1st century (as Saint Matthew predicted), it didn't take long for somebody to come up with another date. In this case, it was a guy named Montanus. He had all his followers move to the desert where they fasted and prayed and waited for doomsday. For entertainment, they listened to Montanus speak in tongues, a religious form of yodeling. The world didn't end, but I'll bet some of his followers wished it had. This Pope was one of the first to use numerology to select the date of doomsday. Je added 666 years to the date of the founding of the Muslim faith, apparently under the assumption that Mohammed was the antichrist. To prepare the world for the big day, Innocent launched the 4th crusade, most notable for the slaughter of tens of thousands of Orthodox Christians when the crusaders decided to loot Constantinople on the way to reconquer Jerusalem. So much for papal infallibility, eh? Newton may have been a genius when it came to physics, but he was a certifiable nut job when it came to religion. He spent most of the last years of his life poring through the Bible, trying to figure out the exact year when the world began as well as the exact year when it would end. In doing so, Newton became the very paradigm of escatology: vast intellectual energy wasted on piffle.